Hacking group Anonymous has aided a global search for a cyber-vandal who defaced a charity website. Members of Anonymous helped track the attacker down to Madrid following a plea from the owner of the RedSky video production company. 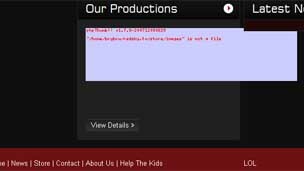 New Zealand-based RedSky asked for help after an attacker penetrated its website, erased data and left graffiti. The attack was reportedly carried out in a bid to impress Anonymous and join its ranks as a member. RedSky boss Bryan Bruce issued a plea on Facebook for help restoring his company's website after a hacker who called himself AnonVoldemort announced that he had hacked the site. Despite his name, the attacker was not a member of the hacker collective but was seeking to show that he had skills they could use. Unwittingly, he offended one of the unwritten rules of the Anonymous group which is to never mount attacks on charity sites. The plea was relayed to Anonymous by one of Mr Bruce's friends who knew someone in the hacker group who was also aware of RedSky's charitable work. Profits from a documentary made by RedSky about the effects of poverty on children in New Zealand were being passed on to charities that provide meals for impoverished youngsters. Within 24 hours of the plea being passed on Mr Bruce got an email providing evidence that the attacker was a man living in Madrid, Spain. In an interview with the New Zealand Herald, Mr Bruce said that he had contacted the police in Spain with the information and was waiting for a response. Mr Bruce said he still had work to do to restore the website as the attacker had deleted all the data on it as well as the backups.